The Ten of Pentacles is the tenth card in the suit of Pentacles. It is a positive card in terms of material retention, don’t expect to be needy or in want of something you desire. The Ten of Pentacles represents financial security, looking for solutions and looking to the past for inspiration. Past – The Ten of Pentacles in the Past position can represent a good financial foundation in your life. You may never have had to worry about money, or at least nowhere near to the degree that your peers do. 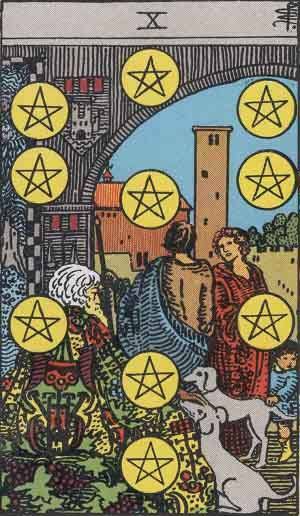 Similar to The Nine of Pentacles, The Ten of Pentacles suggests that you might not have earned this foundation at all. Although this might sound like a bad thing, you aren’t arrogant or ignorant because of it ,so you’ve gained the best of both worlds. Present – The Ten of Pentacles in the present position means life is fine and well. Things are going to go well for the foreseeable near future. Don’t panic or worry if anything bad has just happened, treat it as a learning experience. Think about your own skills are merits and how you can apply yourself on the world. You have the skills but might need a kickstart, so look for someone to motivate you. Future – The Ten of Pentacles in the future position suggests a future struggle that you will overcome, especially regarding finances. This is a good placement, especially regarding business, charity or general finance. Don’t expect things to go smooth, but expect a good outcome eventually. Work / Education – The Ten of Pentacles in regards to work or education means is a good sign. As hinted above, an especially good sign if you are working for yourself, or deal with money. If things are going badly and you dread going to work, just remember not to give up. You could be a lot worse off. Think about the aspects of your job you enjoy and try to turn them into careers. Romance – The Ten of Pentacles in romance is a very good sign. Expect happiness and a general lack of stress. Are you looking for someone? It might be worth thinking about what your traditional ‘type’ of partner is, if you have one. It’s likely to be a good time for you now, generally in life. If you want to spend this time alone, that’s fine too. Friends – The Ten of Pentacles in regards to friendship means things are going well. Don’t expect any arguments or gossip now or in the near future. It might be a good time to get into some deep conversations with your friends, but you don’t need to. Just chill out and don’t force things. Sometimes, the best action is inaction! If you are looking to do something with friends, consider something quite mature; a dinner party, watching a play or opera, or even volunteering to give back to others. Money – The Ten of Pentacles in regards to finances is another good sign. This card really is positive in this aspect. Are you looking for work or have things taken a bad turn? The Ten of Pentacles is a good sign, soon you should be back on your feet. The Ten of Pentacles reminds you that in the end, things will all work out for you and at least in a material sense you will not be longing for anything. Health – The Ten of Pentacles is good when placed for health, as it seems to be for each other life aspect. It isn’t a time to worry, but ponder on the future and what you want to do. Health matters should be of little concern right now. The Ten of Pentacles strongly suggests a solid future where your needs are taken care of. Spirituality and Mentality – The Ten of Pentacles placed in spirituality should mean that you’re currently in a peaceful period of your life. Think outside the past paradigm of your life if it’s been going badly, and start imagining your ideal future. It isn’t something to vividly concentrate on, but idly wonder about. Take things easy and don’t push yourself. In reverse, the Ten of Pentacles represents a future you are longing for, but are unable to fully grasp right now. it could be that the future you’re dreaming of isn’t what you really want, but what others expect of you. What do you really want from life? Is it a lot of money, a stereotypical big house and family? Sometimes these things can trap us; a family can, in some ways, restrict your freedom. Wealth can make you jealous and protective, as well as greedy for more. For starters, and it is an old adage but learn to be happy with what you have now. It’s quite likely that you are better off than most, and many people would wish to be in your position. Learning to be happy with what we have isn’t as simple as it seems. Ten is a special number in numerology. Like nine, it can mean completion, but it can also represent the number one, but on a higher level. Tens should be treated both as the end of a cycle and the start of the next. The Ten of Pentacles suggests that you have just achieved something well, and it has set up a good foundation for the future. To progress, you should look to the past. You should start working on your passions. What did you enjoy doing before? How can you turn that into something that will benefit you in future? Many tens strongly suggest that you will be turning to a new chapter in your life. That isn’t to say that you should forget the past and move on, rather learn from it and grow outwards. We’ve selected live tarot readers to give you a FREE 3 Minute interpretation of The Ten of Pentacles! Scroll through them below and pick your favorite one.